We provide full recaps of each chat, highlighting the lessons learned, key points, and memorable quotes from the guests that joined us. Apr. 30 #ITWCchats – Take a trip down wearables alley – We were joined by Tom Emrich of We are Wearables, CEO of Thalmic Labs Stephen Lake, and Brennan Hatton of Meta Labs to talk about the explosion of wearables in the workplace and Canada’s big connection. Mar. 26 #ITWCchats – Windows Server migration – This channel-focused chat looked at the end of service date for Windows Server 2003 and the resulting business opportunity for Microsoft partners. Feb. 26 #ITWCchats – Mobile Device Managment – Elaine Mah, director of Intel Canada and two CIOs discussed MDM policies in an era of BYOD, COPE, or COBO. Jan. 27 #ITBsmartphone – Why I love my smartphone Sure maybe they didn’t even exist 10 years ago, but these days we can’t imagine life without a smartphone. Jan. 7 #WomeninIT – A special discussion focusing on the careers of women in the IT industry, featuring award winners from our Women in the IT channel event. Nov. 27, 2014: #ITWCjobs – Career advice for IT professionals, whether you’re looking to land that first job, nab a promotion, or sit in an executive office. Sept. 25, 2014: #ITBCMO – The growing role of the chief marketing officer and the path to success. Aug. 28, 2014: #CDNcloud – Examining the cloud in all shapes and sizes for those who offer IT services. July 30, 2014: #ITWCIOT – Capitalize on the trillion-dollar market opportunity for the Internet of Things. June 26, 2014: #ITBprivacy – With Ontario Information and Privacy Commissioner Ann Cavoukian, Public Interest Advocacy Centre executive director John Lawford, and Aluvion Law founder Monica Goyal. April 24, 2014: #EncryptITWC – In the wake of the Heartbleed encryption vulnerability, we spoke with independent security analysts Claudiu Popa and Brad Haines about the wider topic of data encryption and best practices for business. March 20, 2014: #BitcoinITB – Bitcoin has been grabbing headlines for the potential it holds in disrupting the traditional financial system and for its volatility, but what does it mean for most businesses? The Bitcoin Alliance of Canada joined us to discuss along with businesses accepting cryptocurrency payments. Oct. 31, 2013: #CDNWinXP – Ahead of Microsoft Corp.’s end of support for Windows XP, we discussed how to handle migrations to newer OSes with our community of channel partners and managed service providers. Microsoft Canada took part in the chat, as did Gold partner CMS Consulting. 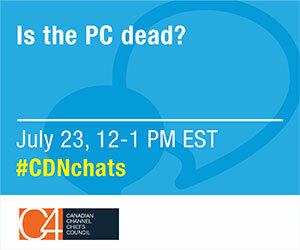 The chat topic trended across Canada. Sept. 26, 2013: #beCASLready – Before Canada’s Anti-Spam Legislation is introduced July 1, 2014, we discussed how businesses can prepare to comply with the law to avoid fines and keep their customers happy. The Public Interest Advocacy Centre and Bret Conkin, CMO of Fundrazr joined us. June 20, 2013: #itbcrowdfund – With sites like Kickstarter and Indiegogo providing businesses new ways to raise money from average people, many wonder if equity-based crowdfunding should be made legal in Canada. We discussed that with Danae Ringelmann, the co-founder of Indiegogo, and Cindy Gordon, the national chair of Invest Crowdfund Canada.